The world’s Rarest Oolong tea? Of the many tea gardens co-owner Ric Allan and I visited during our travels, the one that really stood out was the beautiful Thotulagalla Estate which is perched high up on in the Uva Highlands on the eastern side of Sri Lanka’s central mountain range. Upon arrival we were struck by the breath-taking views across a hazy backdrop of rolling hills, lush valleys and the green of a tropical landscape – most of which was tea. Thotulagalla Tea Estate was established in 1931 and is spread over 200 hectares of land – most of which is formed into hillside terraces where the tea grows in neat lines to form flat-topped picking ‘tables’. The tea here is excellent thanks to the rich and fertile soil, the cooler climate and an altitude of 1,500 MASL. In 1997 the estate was bought by the Muthuswamy family and in a bid to improve the environment, the owners made the decision to convert the farm to 100% organic production. This has resulted in a more sustainable landscape where nature lives in harmony with the tea and its workers. Wildlife includes wild boars, monkeys, squirrels, wild-cats, foxes and numerous species of birds. In addition, shade trees are grown throughout the estate; predominantly pear trees, casia, gravillia and the unusually named nitrogen fixing ‘ ice-cream bean’ tree. The estate employs 184 people – and the vast majority of these live there with housing being provided - all of which have gardens where families can grow vegetables for their own consumption. The tea that is produced on Thotulagalla is processed in several ways: 60% black, 40% green but it was during a cupping on the estate that we were delighted to discover a tiny batch of oolong – which tasted amazing and displayed nuances of sweet peach, honeysuckle and fresh straw. Ever since enjoying that tea we have been determined to import a little and this week our shipment finally arrived (in the post!) – All one Kilogram of it!! But that means we can pack it into caddies and it can be the first of a new series – Storm Micro-lots. 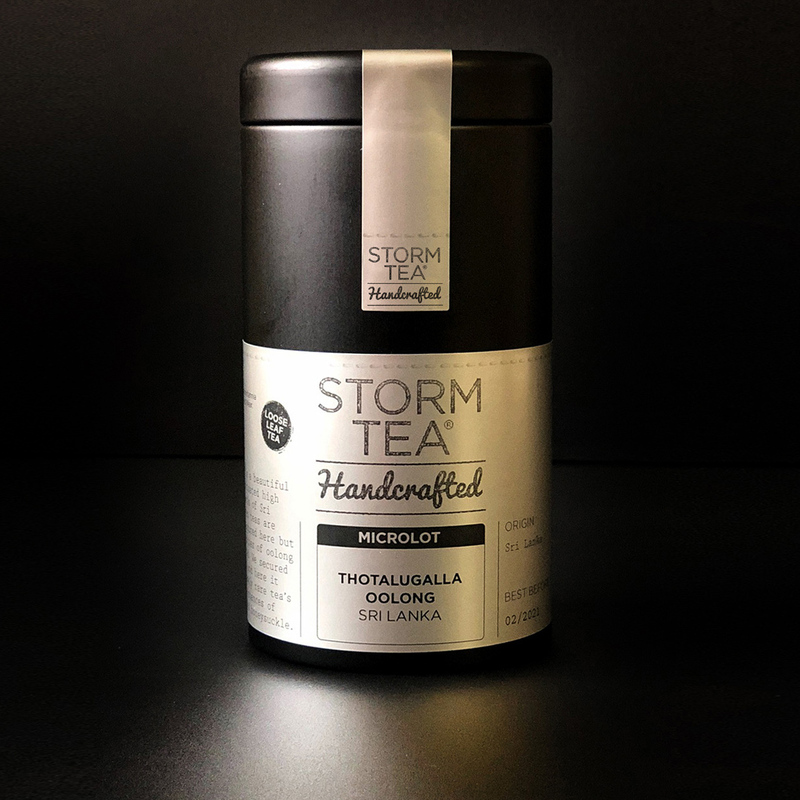 A caddy costs £9.90 so if you’re looking for something extremely rare and really great in the cup – try our oolong Sri Lankan Thotalugalla Oolong. Brew guide (could this go in a cool little box or tea pot – 3g to 250mls, 100 C and 3 mins. Refill two more times since these semi-oxidised leaves are packed with flavour.